The extra touches - we were provided with a basket of oranges for juicing along with butter, jam and milk in fridge. Also fresh bread delivered every morning. Everything was great, easy to reach, the apartment was nicely decorated, clean, warm and equipped with everything you'd need to have a comfortable stay, the view on the farm is quite nice. Ambiente seguro e familiar para as crianças poderem desfrutar da vida da quinta, com a excelente orientação da Dona Albertina e sua família. O facto das crianças participarem activamente no quotidiano da quinta, permite-lhes apreciarem os prazeres da natureza, aprenderem as particularidades das várias espécies animais e cimentarem o respeito pela natureza... sem dúvida uma experiência marcante que os irá acompanhar no seu desenvolvimento. A simpatia e entusiasmo da Marisa, as conversas e explicações do Toni, a afectuosidade que demonstraram com as crianças. A imensa diversidade de animais e a possibilidade de contacto. O cuidado com os pormenores. Excelente! Contato com os animais; funcionários disponíveis, afáveis e muito atenciosos; pão fresco pela manhã; quarto muito confortável e extremamente limpo. Brevemente voltaremos! Adoramos sem dúvida a Arquitetura. Da modernidade e do conforto. A senhora Marisa e o senhor Tony, foram excepcionais. E sem dúvida a diversidade dos animais. E claro, amamos a vitória 🐕 Um alojamento que concerteza voltaremos!! Da simplicidade e simpatia das pessoas que nos receberam e que nos fizeram sentir logo em casa. Da paciência da D. Albertina, da simpatia e disponibilidade da Marisa da amizade do Afonso e da irmã e das histórias do irmão da Marisa. Da Vitoria, da Lady, do Boss do Dante do Cirq, etc. Pequeno almoço excelente, decoração espectacular, bem localizado e sossegado. Excelente local para crianças. 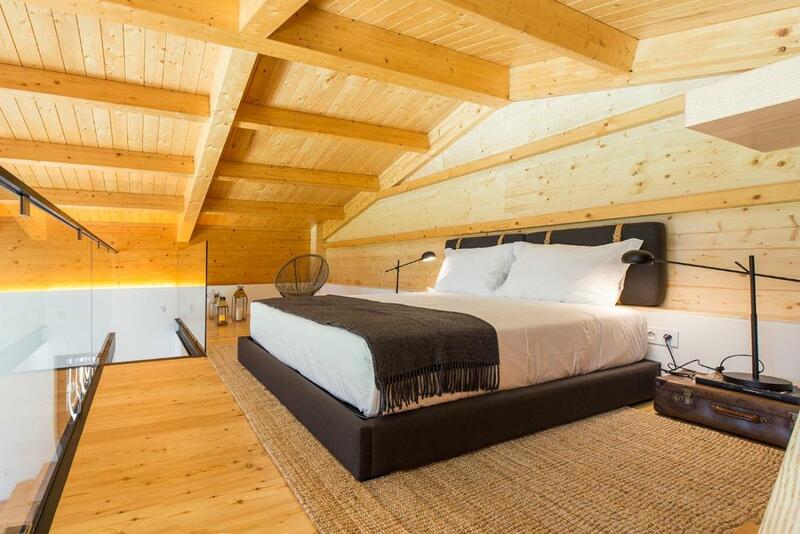 Lock in a great price for Quintãs Farm Houses – rated 9.9 by recent guests! One of our best sellers in Arouca! 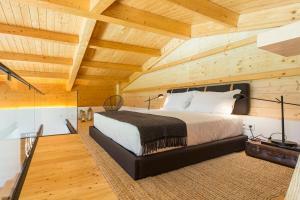 Located in Arouca, Quintãs Farm Houses has accommodations with a flat-screen TV and a kitchen. Free WiFi is featured. Each unit comes with a dishwasher, oven, a coffee machine, as well as a microwave and electric tea pot. Some units include a balcony and/or a patio with mountain or garden views. 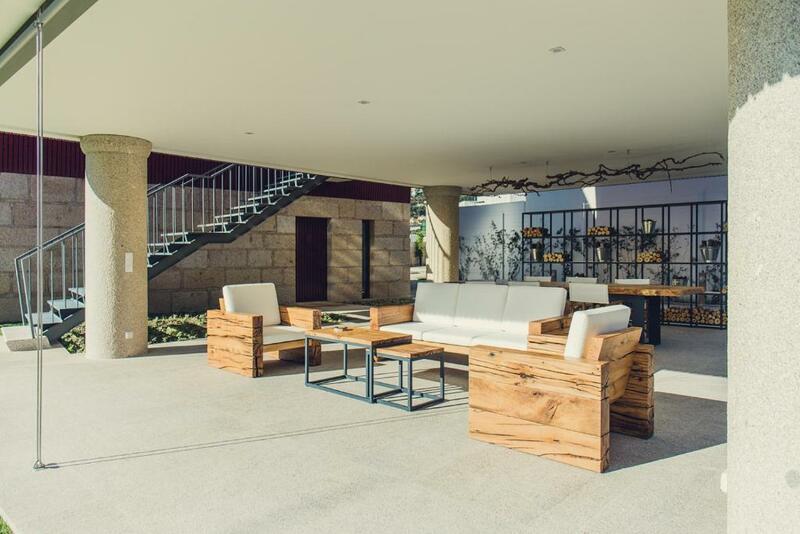 A terrace can be found at the property, along with a garden. 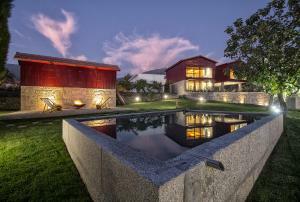 The nearest airport is Francisco Sá Carneiro Airport, 45 miles from Quintãs Farm Houses. When would you like to stay at Quintãs Farm Houses? This apartment has a private entrance, patio and satellite TV. 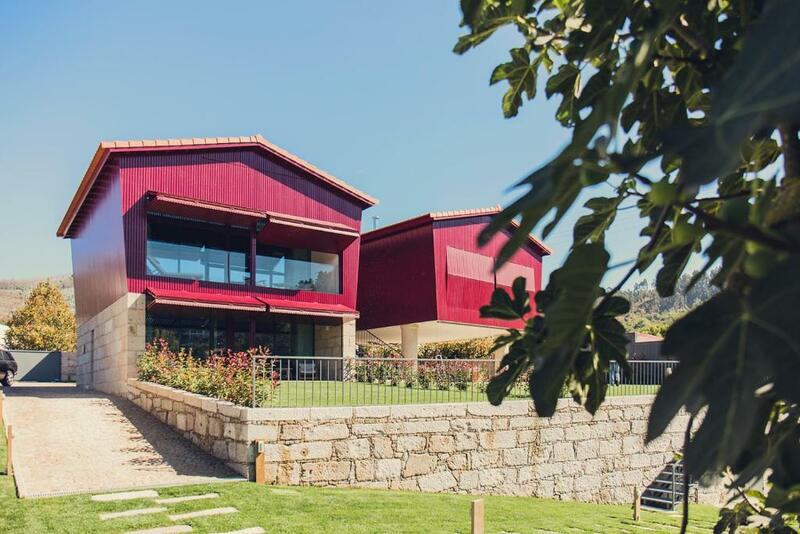 Situada no centro da vila de Arouca, as Quintãs Farm Houses, é a uma das mais icónicas unidades turísticas de luxo na região. Completamente integradas na paisagem, as casas são erguidas através de espigueiros gigantes, onde em cada casa os hóspedes são transportados para um ambiente distinto, mas com um denominador comum: o cenário de floresta e ambiente rural onde o verde é rasgado pelo ponteado de vacas, cavalos, veados, zebras, patos, etc. 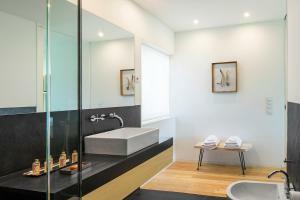 Sofisticadamente decoradas com tons e objetos que unem harmoniosamente o rústico à contemporaneidade, as casas com capacidade máxima de 4 pessoas, são independentes e possuem kitchenette, casa de banho, máquina de lavar louça, um micro-ondas, uma torradeira, um frigorífico e uma máquina de café e uma varanda com vista privilegiada sobre o montado. Possui também acesso Wi-Fi gratuito, ar condicionado e estacionamento, sendo que o serviço de limpeza é providenciado diariamente. O contacto com a fauna e a flora local convidam-no a caminhar nos Passadiços do Paiva, a passear de bicicleta, a montar a cavalo ou, para os mais aventureiros, a desbravar o montado da Serra da Freita de jipe ou uma experiencia de rafting no Rio Paiva. 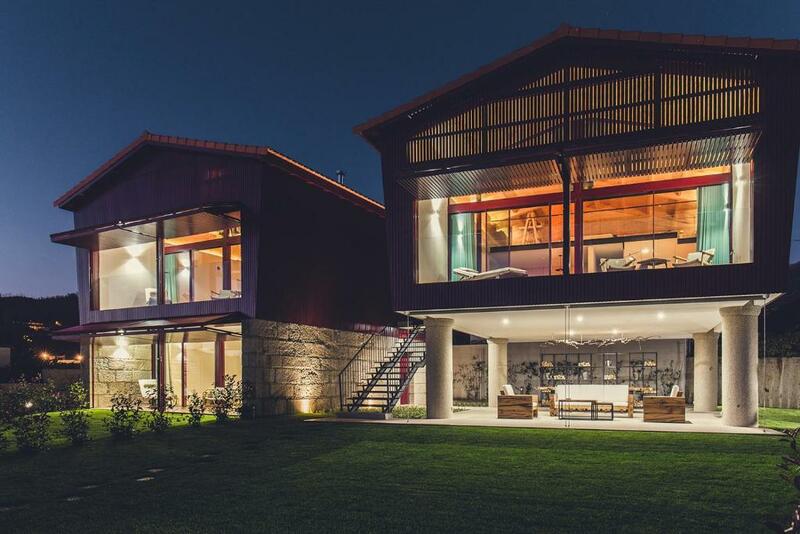 House Rules Quintãs Farm Houses takes special requests – add in the next step! Quintãs Farm Houses accepts these cards and reserves the right to temporarily hold an amount prior to arrival. Please inform Quintãs Farm Houses of your expected arrival time in advance. You can use the Special Requests box when booking, or contact the property directly using the contact details in your confirmation. I can not think of anything we did not like. My only tip for persons that enjoy sumptuous breakfasts: stock up on your favorite breakfast treats in the nearby supermarket - except the bread that is delivered every morning at around 9:15 at your door. When taste and professionalism meet compassion something truly special is the result. Starting wth the room: modern interior with high end finishings using mainly natural materials (wood, stone) by obviously master craftsmen. 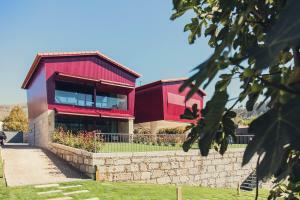 While the air of a quinta (farm house) is preserved the house is equipped with top notch technical facilities. The penthouse was ideal for our two families with younger kids. Unfortunately we could only stay one night and could thus not make use of the fully equipped kitchen (equipped with all top quality kitchenware you can think of) - fortunately a good local Restaurant delivers food to the houses (nicely delivered on real plates), Everyhting is organized and thought through to the last detail - congratulations to the host and interior designer Aurora. We learned that the houses were initially intended to be used by visiting family members and friends and were only made available commercially since October 2017 - what a luck for us. 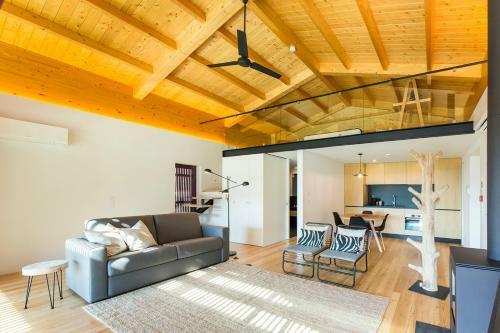 The property: Imagine to wake up on a farm house, have your first coffee on a cozy balcony and overlooking farm stables that house the most unusual animals (incl. Zebras). The whole place is superbly maintained. The hosts: The hosts as well as the administrator of the property were amazing. Firendly, knowledgable, always ready to fulfil any type of desire, extremely kid friendly and with a genuine passion in sharing what they have created. In the few hours we had our kids could ride a horse, pat a zebra, learn about the various species of ducks, swans etc on the property, play on a pile of sand with toys provided by the property etc etc. Our kids will certainly remember this place as a magic place with amazingly friendly people as they even received an Eastern themed farewell present. 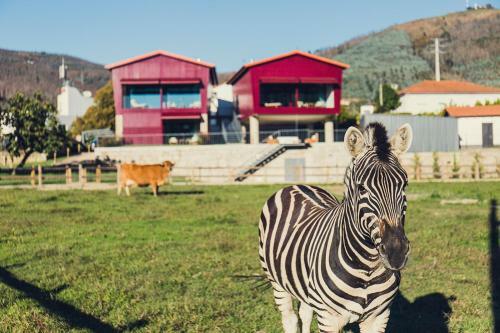 Location: Arouca is very much out of the way of the mainstream tourism spots of Portugal. However, it has several geologically and historically interesting hiking opportunities incl.